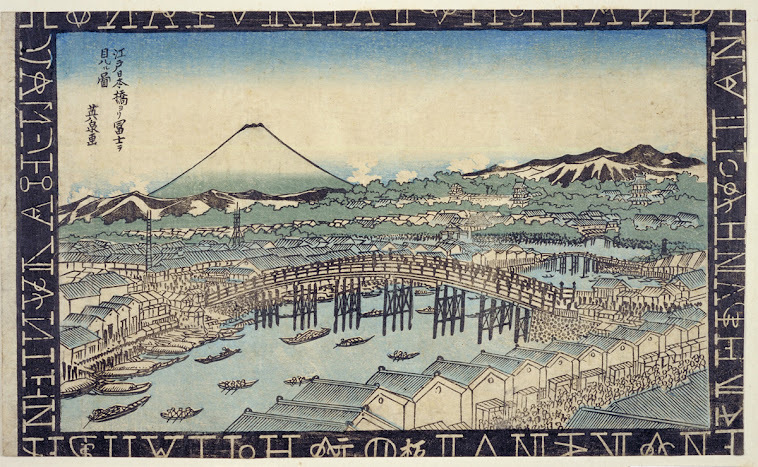 Kawasaki was a bustling metropolis in medieval Japan. Built at the foot of Kawasaki Daishi temple, the town was an important stopping point along the Tokaido highway, which connected Kyoto and Edo (the old name for Tokyo). On the ferry boat (watashibune 渡舟) you can see a traveler relaxing while taking a smoke.
. Rokugō, Rokugo no watashi 六郷の渡し Rokugo river crossing .
. Temple Kawasaki Daishi 川崎大師 . The road to Edo is busy, even this early in the morning. We are travelling along the main highway that leads from the imperial capital of Kyoto to Edo. This road, known as the Tokaido , is the busiest thoroughfare in all of Japan. It is used not only by merchants and local villagers, but also by many pilgrims making the long trip from their homes in Edo to the most important temples and shrines in western Japan. In addition, you can sometimes see large companies of samurai, marching on the long journey between their home provinces and the military capital, in Edo. The Shogun -- the military leader who rules Japan -- does his best to ensure that free travel is maintained throughout the country. However, although even the poorest peasant is allowed to travel about the country freely, all of the main roads in and out of Edo are guarded by seki (barriers), where guards stop all travelers to search for troublemakers and check everyone for weapons. We are approaching one of the seki right now. If you look up ahead, you can see the guards standing in front of a large gate that marks the last seki on the road into Edo. The seki are checkpoints set up at strategic locations along most of the All of these main roads are guarded by seki. In addition to helping regulate trade, these barriers are important control centers for the Shogun. It is important for the government to ensure free travel throughout the country, since this helps promote trade and economic growth. However, if people are allowed to travel freely, there is a chance that some will try to plot against the government, or take part in smuggling. The seki are one of the main systems of preventing such unlawful activity. Fortunately, we should be able to pass through the seki very quickly. We are just common folks, and we certainly don't look like troublemakers. There are a bunch of other farmers and laborers passing through the gates, and they all look pretty much the same. Most peasants wear simple clothes -- a kimono made of cotton, a fundoshi (loincloth) and straw sandals. 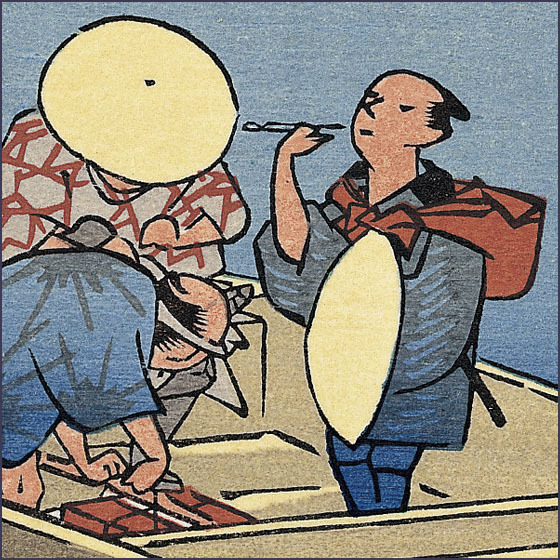 A few of the more wealthy farmers may have an outer kimono, with a fancy design on it, or they may wear geta (wooden sandals) instead of sandals made from straw. None of the people passing through the gate with us has any bundles big enough to conceal a sword. 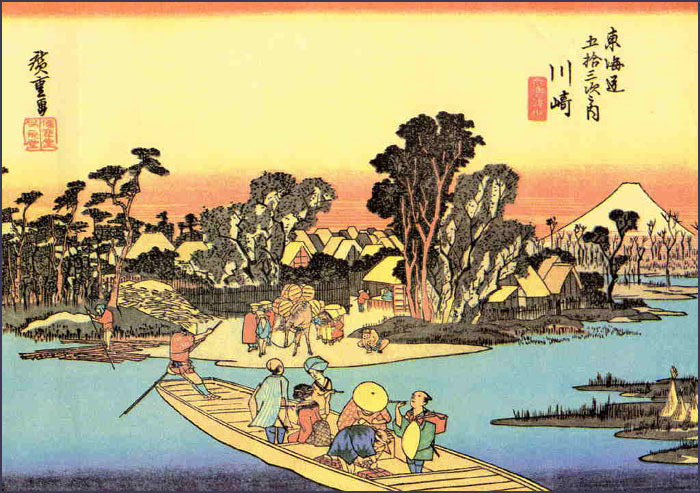 Most of them are just carrying vegetables to sell in town, and some have nothing at all except a few coins to pay for the ferry boat that takes people across the river and into Edo. Japanese coins have a hole in the center, so they can be tied together on a string like beads on a necklace. This makes them easier to carry. The guards let us pass through the gates one by one. Inside the main gates is a large building for the guards and officials who run this seki. People who are carrying large loads of merchandise have to go into the building and have their goods inspected. Merchants have to pay a tax on all of the goods that they sell, and before they ship them to other parts of the country, they have to get an official stamp to prove that they have paid the tax. The guards check these stamps and make sure that the merchants are not trying to smuggle merchandise without paying the tax. People who try to smuggle goods through without paying the tax have to pay a stiff fine -- usually, several times the amount of the original tax. Since we don't have any heavy belongings, all we have to do is pass through a small corridor where the guards do a body search to check for weapons. There are both male and female guards, since somebody has to search the women who pass through the seki. After the guards have made sure we aren't carrying any weapons, they lead us out of the building and through another gate on the opposite side of the seki, where the road continues on towards Edo. is one of the seven wards of the city of Kawasaki in Kanagawa Prefecture, Japan. ..... Under the Nara period Ritsuryō system, what is now Kawasaki Ward became part of Tachibana District Musashi Province. 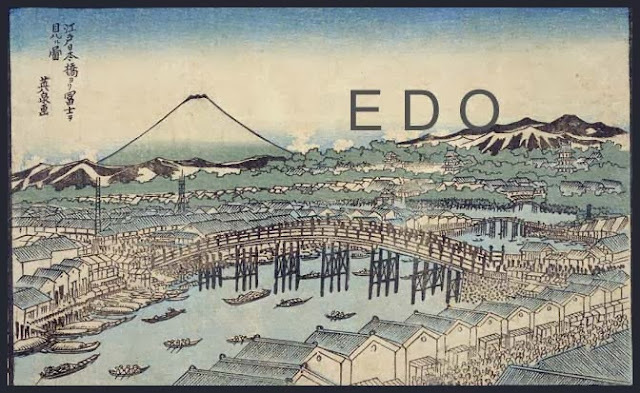 In the Edo period, it was administered as tenryō territory controlled directly by the Tokugawa shogunate, but administered through various hatamoto, and prospered as Kawasaki-juku, a post station on the Tokaido highway connecting Edo with Kyoto. After the Meiji Restoration, the area urbanized with the development of Kawasaki Station on the Tokaido Main Line and became a center for heavy industry. The area was largely destroyed by the Great Kanto earthquake of 1923 and during American bombing during World War II. Kawasaki Ward was established with the division of the city of Kawasaki into wards on April 1, 1972. Long associated with crime, labor unrest, organized crime and pollution-related diseases, the local government undertook extensive efforts in the 1990s to revamp the area image.
. Asao ku 麻生区（あさおく）Asao ward .